Like Migs said in the comments section earlier – when you are building a showcase army like I am doing here, it’s very essential that you add troop types from all size categories. 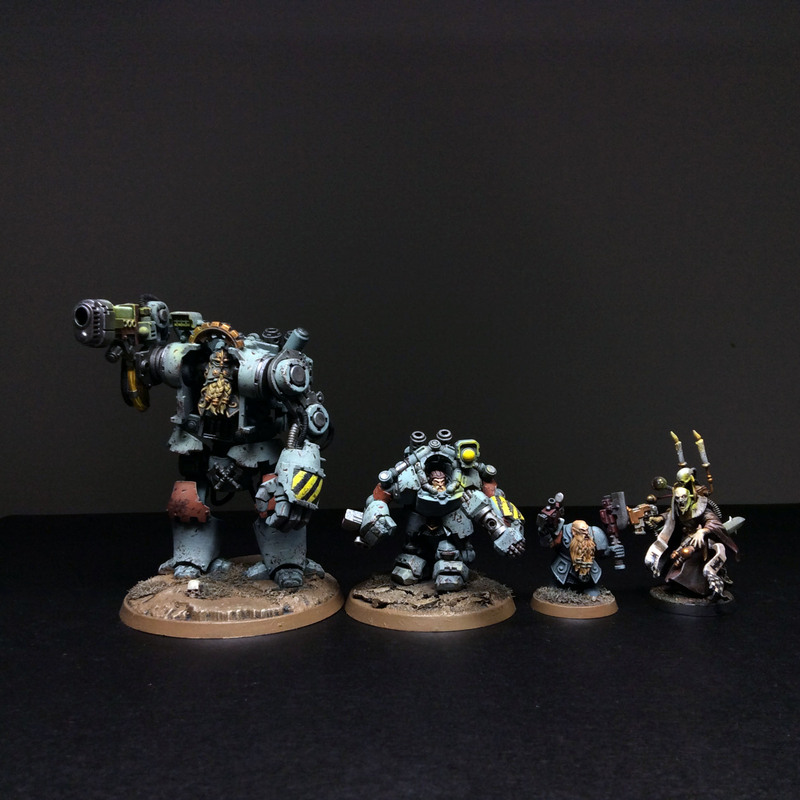 Having different sized models in your army brings it all into perspective. Having a Squat army that would only include infantry and few characters would make the whole army look pretty harmless bunch of stunties! Dynamic composition is what makes the army look threatening – the smaller infantry units make the bigger models look even bigger and menacing, thus emphasizing their role in the force. Here we can see some comparison against my infamous Inquisitor Pherion of Mars! He’s pretty old and crooked by his frame but his still pretty human sized character never the less. Anyway, Im pretty sure many of you are dying to hear about the other two models next to the Exo-suit! Being so crap at photos I look forward to how it’s done – keep it short and simple tho please as I’m an old dog …. I totally agree that it’s important to vary sizes and unit types to get a more dynamic and interesting look on your army. Will you field any vehicles btw? Bloody love these. Especially fond of the dreadnought. I didn’t realise the squats were quite so diminutive. Really cool to see the size comparison. Really looking forward to the photo tutorial – you guys manage to take some stellar shots without “proper” cameras. I need to up my photo game – if that’s possible without ditching the iPhone so much the better! 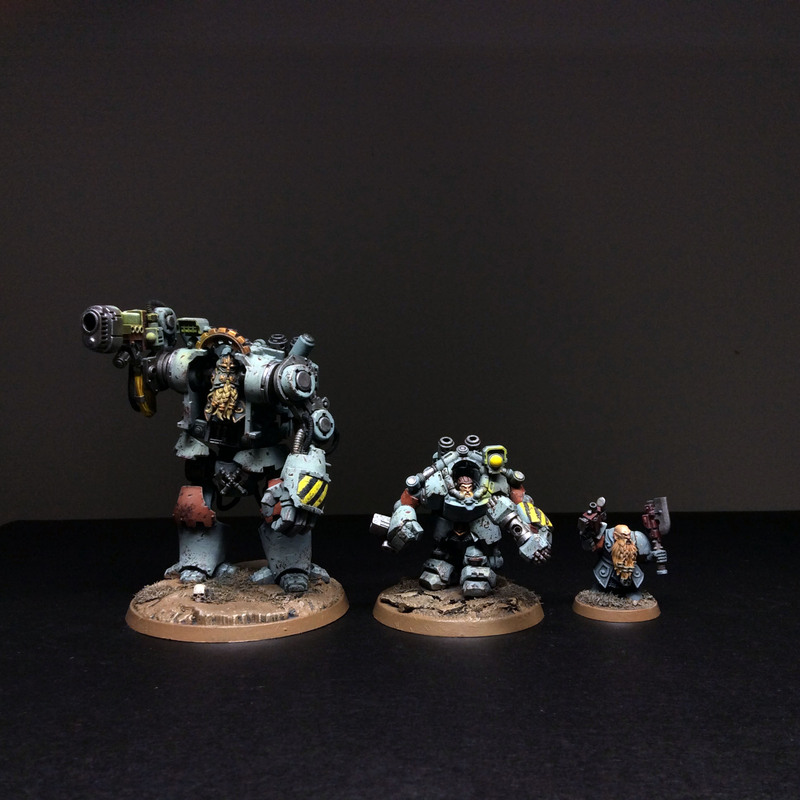 Almost same info here as in Migsula’s post: “Monochromatic” paint scheme is ace. They sure look like weapons and armors of labour – not only the tools of mass destruction. Personally this sort of subtle hinting are the main reason why converting and painting makes usual hobby tasks much more rewarding. There’s always a reason why certain things are as they seem at the first place. There’s a chance to tell a story in one of piece of infantry – I think you’ve achieved this goal of describing tale.